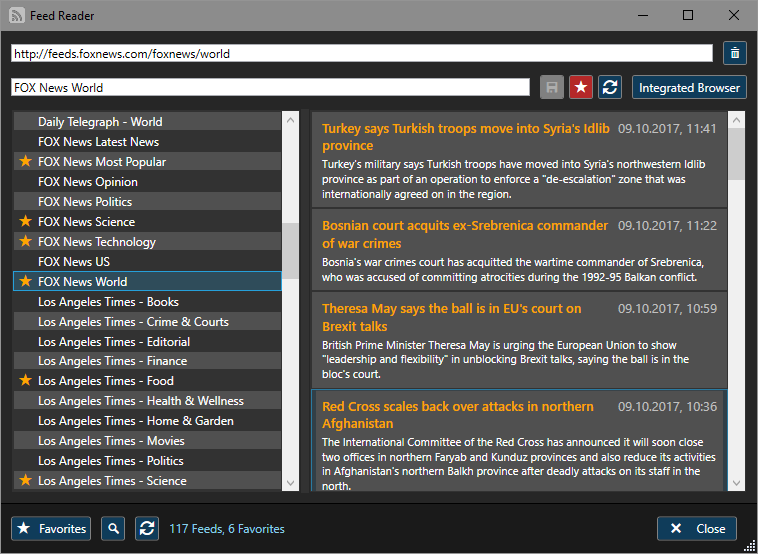 The Feed Reader module is a useful tool to keep track of the latest news around the world. It can show RSS and Atom feeds, filtering out any links or pictures - just the title, the date and the abstract (if any) is shown. To read the whole article, you can click the article list item. Please notice that some news agencies (like AP) do not link to single articles, but to a general news page! There are thousands of feeds available on the internet, which can be found on the websites of news agencies, newspapers, TV stations and other companies or via Google or any other search engine. Just enter the name of the company and the keyword feed or rss into the search field and if there is a page with the feed addresses it will show up. 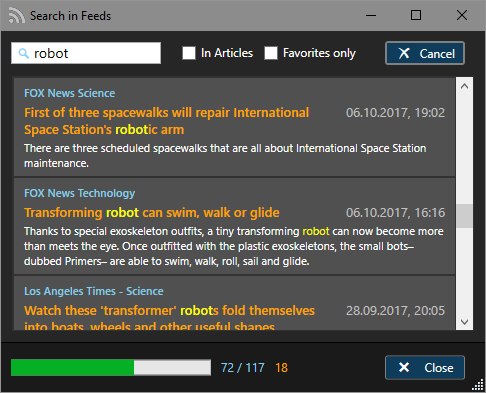 The Feed Reader comes preloaded with a large collection of feeds. You can delete some or all of them and add your own. You can also mark feeds as "favorite" and show only the favorites, leaving the original list unchanged. The Feeds module features an integrated browser, which can optionally show up in the lower part of the dialog. If it is not activated, a click on an article opens the link in the default browser. To set a feed as a favorite, select it in the feeds list on the left side and click the favorite button (star) on the right side of the title text field. It will be marked with an star icon in the list. To show only favorites, press the "Favorites" butto below the feeds list. To ADD a new feed to the list, paste the feed address (URL) into the address textfield on top of the dialog. The program evaluates the address and if it considers it valid, the "+" (Add) button will be shown. Press it to add the new feed to the list (or just hit Enter). The new feed will be added at the bottom of the list. To order the list alphabetically, press the "Refresh" button on the bottom of the feeds list or restart the dialog. To RENAME a feed (change the title), just overwrite or change the currently shown feed title in the text field and press the "Save" button (or just hit Enter), which will be enabled as soon as the title is changed. To DELETE (remove) a feed from the list, select it in the feeds list and press the button with the waste bin icon next to the address text field. 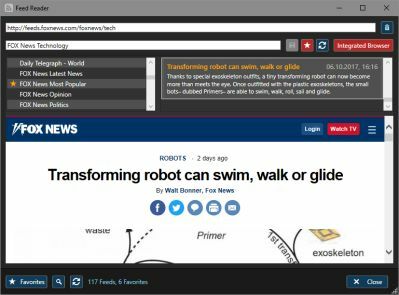 To search for articles with a certain word or phrase in it, click the magnifier button on the bottom of the feed reader dialog. The search popup features a text field to enter your search word or phrase. You can choose to find only articles with the search word in the title or (optionally) also inside the abstract text ("In Articles"). When you check "Favorites only", only feeds with the "favorite" tag will be searched. The searching process takes some time; you can cancel / stop it at any time. You do not have to click the Search / Cancel button, you can just hit Enter. In the status bar you can see the process (in percentage) with the current feed that is searched, the total number of feeds and the number of found articles. If you haved accidentally deleted feeds or just want to have the original list back, you can download it here (right-click link and "save target as"). You can use it to overwrite the current file inside the program settings folder: C:\User\YOUR_USERNAME\AppData\Local\Sharp World Clock 8\feeds.xml or put it into an exported Settings.zip file and import it back.